Hi all! I hope you’re having a fantastic weekend so far, I know I am! I have just used Random.org to decide the winners of the Pantene Giveaway, and they are…. Andrea, Gilly and Tiffany! Congratulations ladies! I will be emailing you soon to get your postal details. Thankyou to everyone who entered. Readers from the US and Canada, don’t forget to enter the Skin MD Natural Competition – entries close on February 27. If you have not yet been exposed to Australian organic skincare brand Grown – please head right over and check out their website. The philosophy of the brand is that “beautiful healthy looking skin comes from a profound understanding of nature’s power”. Sound like your cup of tea? Yeah, me too. Well, let’s begin with the ingredients. The Vanilla & Orange Peel Hand Cream contains goodies such as antioxidants from grape seed, wheatgerm, camellia seed oil and rose hip oil. If you’re not already aware, I am in LOVE with rose hip oil. (see here, and here) It’s an amazing product, and to find a natural hand cream that uses it as an active ingredient makes me extremely happy! This is a natural hand cream, so it contains none of the bad stuff like lauryl sulphate, petrochemicals, artificial fragrance, animal dervatives and parabens. Grown is a company dedicated to the love of nature, so the packaging is recyclable. (bonus points!) So all of this sounds like the makings of a really great product, but does it work? Joy of joys – yes, it does. The Grown Vanilla & Orange Peel Hand cream is a rich and heavily moisturising cream that sinks in easily to skin and does not leave any oily residue. I have found this really great to use when I’m at work because I can apply it and then get right back onto the keyboard without having to worry about leaving any greasy marks, or my fingers slipping off of the keys. The smell is very pleasant too, strong but not overwhelming – a sweet orange smell, but not too citrusy. I love this product so much that it has earned itself a place in my beauty cupboard, and is now one of my HG hand creams. Exciting! The only thing I didn’t like about this product, (and it’s a completely personal thing to me) is that the smell of the cream tends to linger. It is a delicious smell, but it lasts quite a long time, so if you’re sensitive to scented products like I am this could bug you after a while. The Vanilla & Orange Peel Hand Cream 65ml retails for $24.00 AUD. 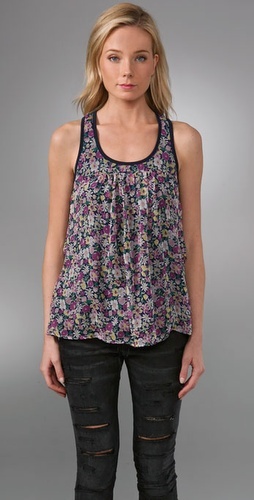 Grown products are available for Australian purchase from David Jones, Myer and other selected outlets. Check the website for a stockist near you. My two favourite style inspirations were rocking some gorgeous fresh-faced looks during NYFW this week… They both look gorgeous. I love these girls! I recently tried out the Pantene Deep Fortifying Range for review, and was once again impressed by the new products that Pantene is putting out on the market! The Deep Fortifying Range is all about targeting the weakest part of the hair to strengthen it and prevent breakage. My hair has been a little bit crazy lately after dealing with the stress of the hot weather combined with the deep freezer temperature levels of my office at work, so this was just what the doctor ordered. The first thing I noticed is that I really like the smell of this particular range. For some reason this line smells a lot fruitier than the others that I have used. I like it. After using the shampoo and conditioner for over a week my hair feels a lot softer, and my ends are looking a lot less frazzled. I don’t really treat my hair that well (I have to wash it daily and a blow dry afterwards is necessary in order for me to look presentable for work), so I wasn’t expecting miracles, but my hair feels a lot better after a week of using the Deep Fortifying Range. A little of the product goes a long way, so as always you can’t really beat Pantene for value for money. I know it’s probably annoying when I say ‘nothing’ but I honestly have to say I can’t find anything wrong with this product. The Deep Fortifying Treatment is designed to sustain the effects of the shampoo and conditioner. It’s super thick and feels really nourishing on the hair. 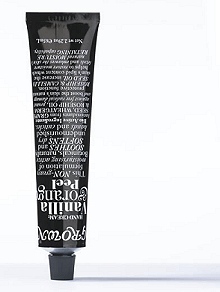 I also like the fact that the treatment comes in a giant tube. I have trialed other hair treatments in the past that come in a tub, and it’s such a messy process! The giant tube is definitely my preference. I love the fact that you see instant results after using the mask. My hair felt soft and silky after just one conditioning. 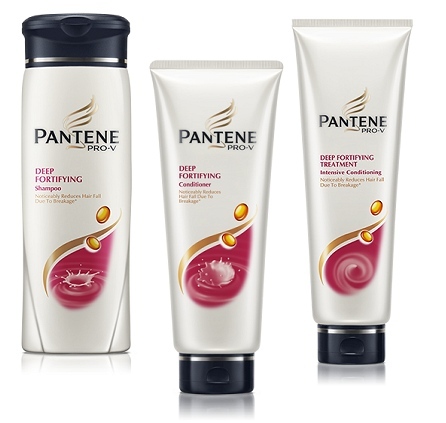 The Pantene Deep Fortifying Range is available from leading supermarkets and pharmacies. Check out the website for a list of all of the Pantene Ranges available. Does the Deep Fortifying Range sound like something you want to try out? Be sure to enter our giveaway, entries close on the 20th of February 2010. Good luck! As I have mentioned in earlier posts, I am trying to keep better track of my finances this year. This means attempting to save more money than I spend – making steady repayments on our mortgage, and getting bills paid on time. This also means setting myself a budget when it comes to what I am spending my “allowance” on. So I have written myself a shopping list (too long to post, it’s insane really) and will post what I buy on the blog so that I can share the joy. You’re excited, I can tell. Anyhoo, this fortnight, I have purchased something for my wardrobe. I took advantage of Shopbop’s free shipping for orders over $100, and decided to get the ring to bring my shopping bag over the $100 mark. I am a sucker for anything to do with peacocks. I don’t know why that is, but there you have it. Give me anything with a peacock print or peacock theme and I instantly have to have it. 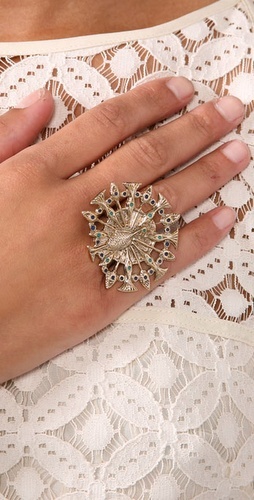 The House of Harlow peacock cuff is on my shopping list, (and I do plan on getting it in the future) but I think the ring is kind of adorable too. So after these two purchases, I am left with $15 in my shopping piggy bank. That won’t buy me much, so I think I’ll put it towards next fortnight’s purchases. After reading Yvette’s guest post regarding facial uniforms over at Primped, I started to think. Do I have a facial uniform? And the answer was Yes. Yes I do. I have a go-to-face that gets me through life quite easily. I recently started to mix things up (red lipstick ftw) but I always tend to stick to the same formula. For me it’s fast, it’s easy, I like it, and it works. It’s simple really – porcelain complexion, champagne eyeshadow, dark lashes, pink flushed cheeks and muted pink lips. I don’t often step outside of this equation, except I often add dark eyeliner and a few extra helpings of shimmer to my eyes and cheeks at night. 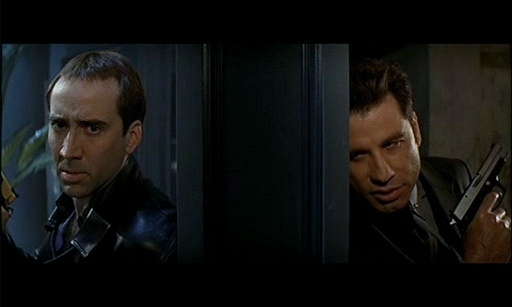 Where did my original inspiration for my go-to-face come from? Let me introduce you to Liv Tyler’s Perfect Face. Do you have a go-to-face? Is it based on any specific person or celebrity? Do tell!